If you have followed our blog at all you know Sue and I have shared a couple of different vegetable crust pizza recipes. 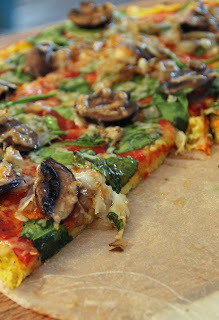 Our Cauliflower Crust Pizza and our Spinach Crust Pizza have been very popular. Lately I have been all over everything spaghetti squash so I decided to see if I could come up with a spaghetti squash pizza crust. This one is definitely my favorite of the veggie crusts thus far. Umm....yeah.....that's for 1/4 of the pizza. That's HUGE people! This is only 1/8 of the pizza. So...only 106 calories!! Crazy, right? Preheat oven to 400. 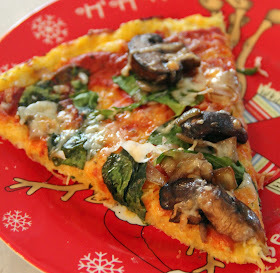 Line pizza pan with parchment paper (DO NOT skip the parchment paper!!). Set aside. Press your spaghetti squash in a strainer to get out any excess moisture (or use cheesecloth). 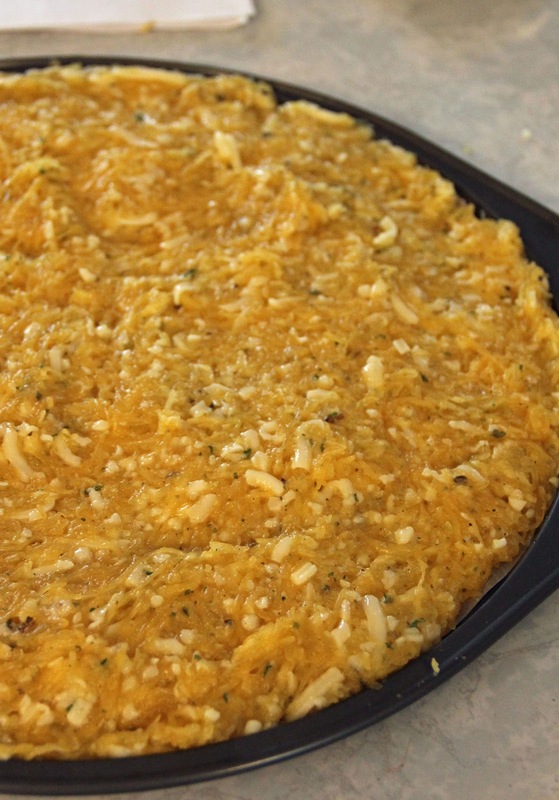 In a large bowl, combine spaghetti squash, mozza cheese, egg & whites, garlic, and spices. Mix together until well combined. Let sit for a few minutes - if you notice a lot of liquid gathering in the bottom of the bowl then drain it off. 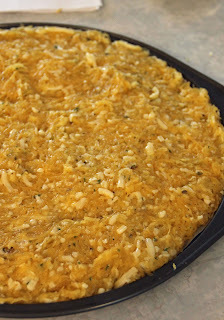 Press the squash mixture evenly into the prepared pizza pan. Bake at 400 for 12 - 15 minutes, until crust appears dry. While the crust is baking - saute the mushrooms and onion in a fry pan until mushrooms are soft and onions are translucent. Remove from heat. Spread the pizza sauce over the crust. Spread your onion and mushrooms and spinach over the sauce. Top with the Parmesan cheese. Return to 400 degree oven and bake another 10 - 15 minutes or so - until cheese is bubbly and edges of crust are browned. You can place under the broiler for a minute or two if you really want to brown things up. This veggie crust is a little higher in calories than the cauliflower and the spinach version BUT is still way less than "regular" pizza. It does have more protein than the other versions and is still less carbs than a "regular" pizza. Oh, yeah, I should probably mention you won't be able to pick this up to eat it...maybe when it is cold but definitely not when it is hot. Break out the forks people!! I know I tend to ramble on when I like a new dish but I can't help it. Be sure to stop by Carole's Chatter for some fantastic links!! This is an excellent idea! 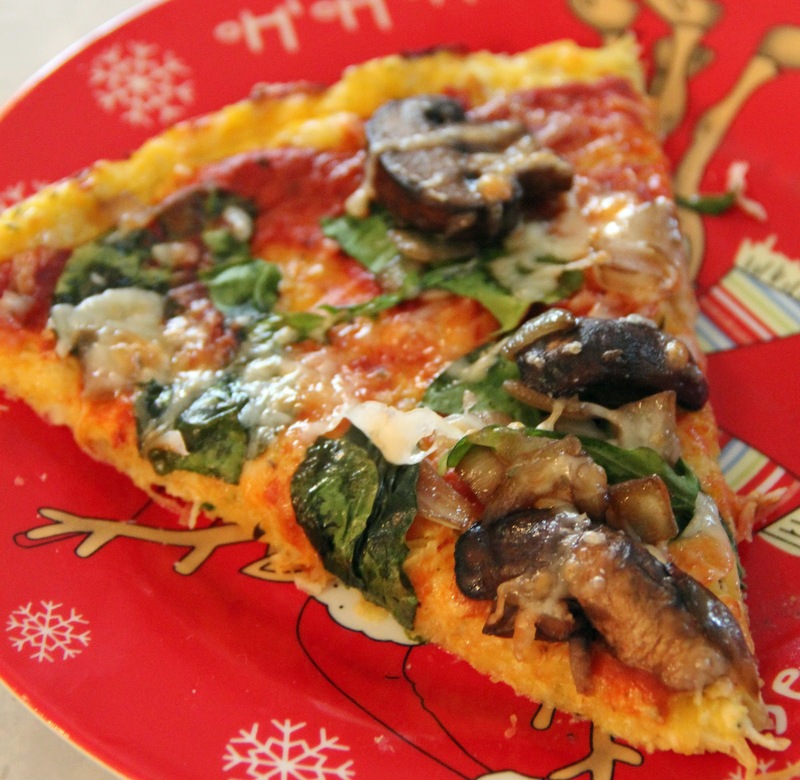 So much healthier than regular pizza! I love spaghetti squash! i have been eyeing the cauliflower crust for a while.. but this looks even more gorgeous. pinned it. Thank you :) It turned out very yummy! This does sound very yummy. Quick question: what size pan did you use? I just went and measured :) It is 12 inches across. Making it right now!! I can't wait to eat it! I did exactly what this recipe says and my squash never turned out like a crust. I even left it in the oven longer. So basically it was a spaghetti bake that tastes like pizza, but it's awesome!! Thanks for sharing. - spread cooked squash loosely out on sheet and baked again for 30 minutes at 150 to dehydrate a little. - after spreading mix onto parchment I patted down firmly with paper towel to absorb some more moisture and compress squash. - baked at 400 for much longer than directed, (maybe due to oven) and flipped over once onto another parchment sheet to crisp the bottom. Thanks! I made this and enjoyed it. Linked recipe back to you. best pizza i've ever ate! 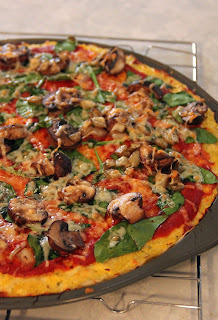 Tried this tonight - except added a little ground flax and bean flour ... I baked the crust for a LONG time... and pulled it out after 45 minutes.. I then realized if I flipped the crust.. it might become a bit crispier! I managed to flip the pizza crust onto a new piece of parchment paper... and it's crisping up beautifully. Mmmm! Great recipe! I didn't have parchment paper so I used aluminum foil and it turned out just fine! I use same recipe, adding 1 tsp garlic powder, 18 tsp sea salt, 2Tbsp pecorino cheese and 1.5 tsp oregano. it is important to utilize all the squash and scrape all the flesh off of the skin. I take an extra step to chop it all up, easier to spread. I just keep flipping it until it is dried, can use as "toast" points, as well. Other variations, use original base recipe in this blog. before popping into oven, top with sesame seeds or poppy seeds, dried onions, pine nuts, course salt... you get the idea. My kids are allergic to dairy. Is the mozzarella totally needed or is there a possibly a replacement? Yes, unfortunately the cheese is necessary as a binder. Without it the pizza would probably fall apart. You could try and sub a non-dairy cheese, such as a soy cheese, to see how that worked. Hope that is helpful! Awesome recipe. 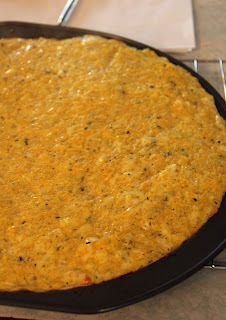 I'm going to try using a pizza stone to get the crust crispier. This looks great! But my daughter is allergic to eggs and egg substitutes. Are there any other options for binding ingredients? Ok, can't believe I'm writing this, however, this turned out awesome! I drained and pressed out moisture in squash before mixing cheese, eggs, etc. I pressed it all into a 12" tart pan with removable bottom. Worked perfectly w/o parchment, drizzled a bit of evoo on bottom of pan. I did bake it for at least 30 min. I topped mine w/sauce and chopped grilled vegs, i.e. zuchini, eggplant, garlic, roasted red peppers.........whatever cooked vegs available....sooo good! After my raving over it, my daughter made it for her family...five small children....and they loved every bite! I can't wait to try the cauliflower version......tomorrow! We are serious veg eaters.....thank you for the great ideas! BTW, I made the black bean brownies and I cannot believe how delicious they are! Bringing them to my grands to see them inhale them! I have never written anything like this before, but had to let people know how impressed I was with your recipes. Love to cook healthy, tasty food.......thanks again...you've got my attention. 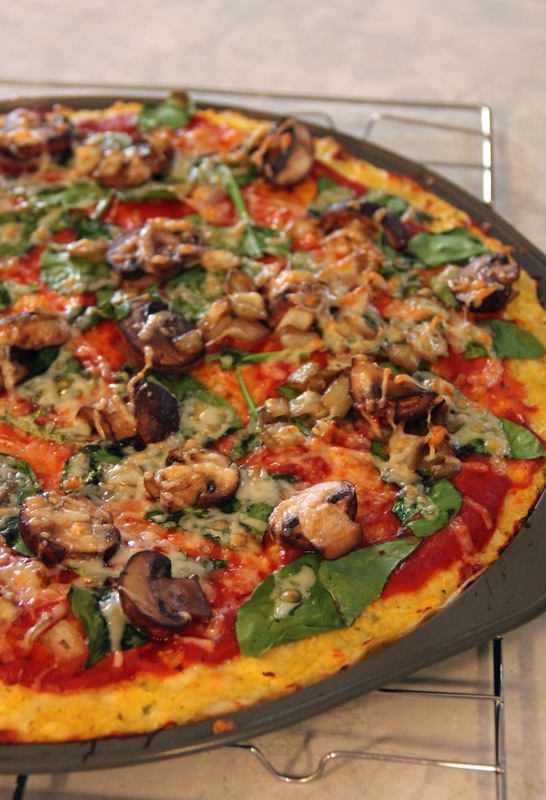 Just baked the cauliflower crust pizza......looks great! This time I used a 10" spring form pan. Medium size cauliflower. Choped cooked, grilled: chicken, onion, summer squash, zuchini, and roasted red pepper. I microwaved the head of cauliflower while whole for 6 minutes. Cooled slightly, chopped and put into food processor, several pulses...perfect. Baked crust approx 25 min, added sauce and vegs with shredded medley of Italian cheeses on top, baked 5 min until cheese melted...yummmmm! Yay! So happy you enjoyed that one too! I can't wait to try this pizza, Thanks for sharing..
Holy Buffalo Mozzarella this was DELICIOUS, just made it, my husband and I just finished eating it. 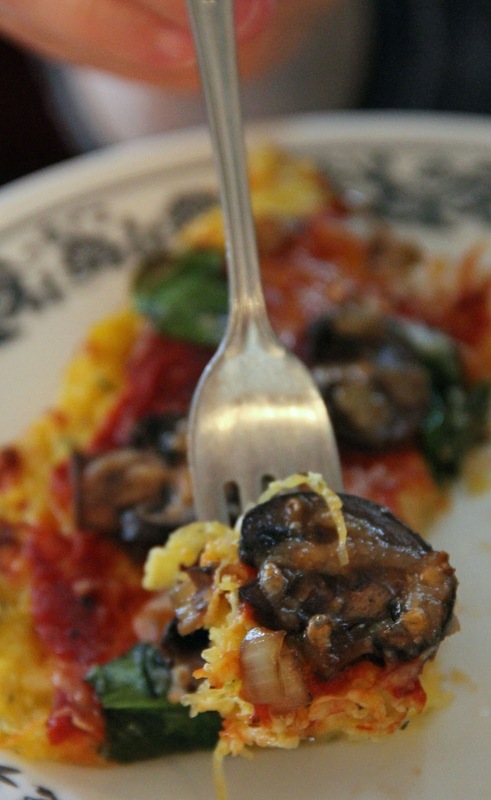 Only had 1 small spaghetti squash, so my crust was on the smaller side, but still used 1 egg and lesser seasonings. Crust formed nicely in the oven. I topped it with, Rao's marinara sauce (THE BEST SPAGHETTI SAUCE OF LIFE - if you have never tried it you need to - we buy it buy the case load in our house) anyway, topped with marinara, buffalo mozzarella (avoiding dairy and this is really from water buffalo and has no lactose - yippie!) sliced mushroom, sliced onion, sliced garlic, sausage crumbles, fresh basil, and then another layer of buffalo mozzarella and a drizzle of marinara ... baked for 15 minutes ... was AMAZING. I have put leftover cooked spaghetti squash with spaghetti sauce & Parmesan in the freezer to take to my dad's a month later. Turned out fine. Don't know about this recipe... hmm.. maybe I'll give it a try. I tried that and it seems to be more soggy than when you cook it fresh and make it. OMG! My husband is making this right now and, boy, does it ever look good! He added cocktail shrimp on it as well and the smells from the kitchen are amazing! Just made this! Delicious! Thank you! 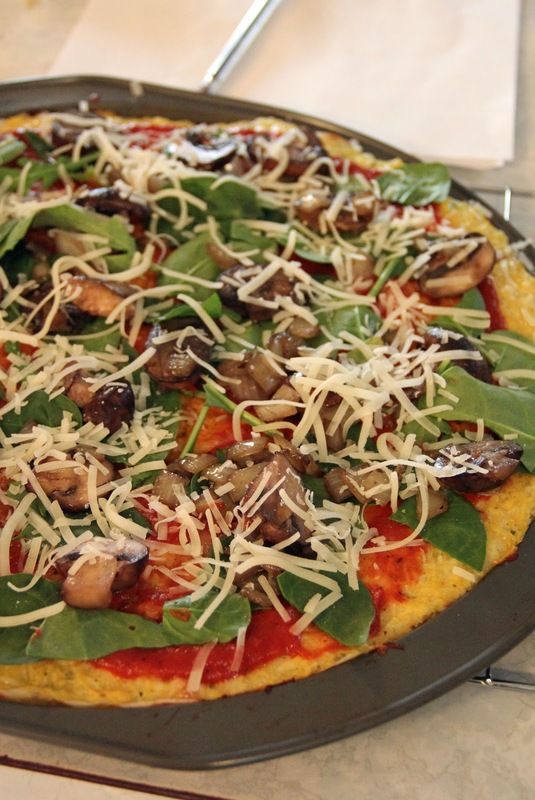 I've finally found my go to recipe when my pizza cravings kick in! This has probably been mentioned before but I just wash my spaghetti squash well, stab it about 6 times with a knife to the center of the squash and put it in the microwave until it's soft, 15 minutes or so. Take it out with mitts on, cool it a bit, slice it open and take out the seeds. Sometimes I have to cut a seed or two with scissors but it's so easy that way. By the time I get the rest of my ingredients ready, the squash is finished and I don't even feel like I've done anything yet. This looks so amazing. For the parent that has kids with allergies; "Follow Your Heart" has dairy free mozzarella and provolone cheese slices that would work as an egg and cheese swap. They taste good, and are very stretchy when melted. They are animal product free so you will find them in the Health food/ Vegan area in most larger grocery stores.